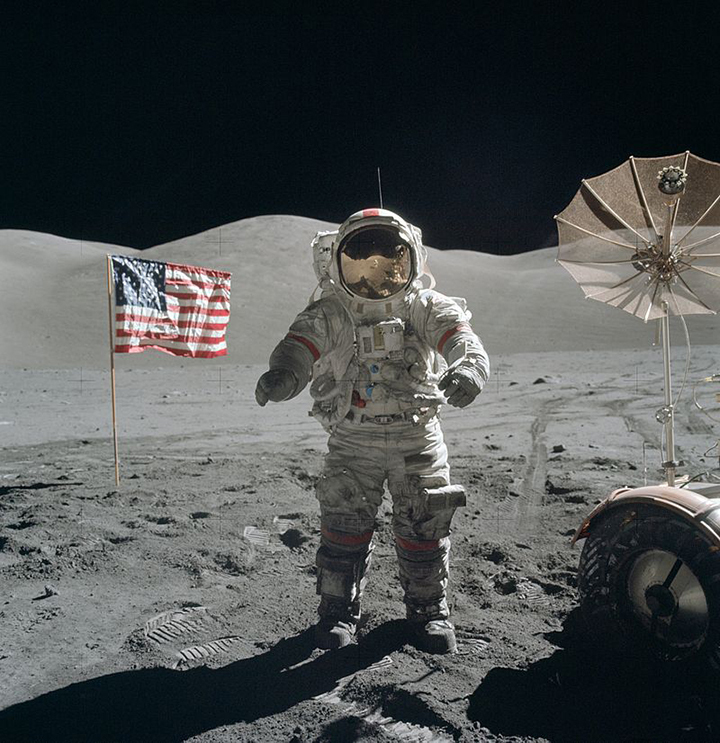 An outstanding film about Cernan was released in 2014, entitled, appropriately enough, The Last Man on the Moon. At this moment, we are to space what the Chinese were to the Age of Discovery. China had huge armadas sweeping the Indian ocean all the way to Africa, trading and spreading Chinese influence. There were doing this for half a century before the Portuguese “discovered” the Indian Ocean, and almost a century before Columbus first stumbled upon the Americas. Then, Chinese xenophobia asserted itself with a crushing vengeance, and it suddenly became illegal to travel across the ocean. China, you see, was the greatest of nations, so what was the point of encountering inferior races? Consequently, the West discovered, and conquered, and colonized, rather than the East doing those things. If not for that phenomenally isolationist move by the Chinese emperors, the thrust of history over the past half-millennium would be entirely different — and in many ways, a mirror image. What will be the consequences of that decision for the next 500 years? Manned space exploration is exciting, but excepting the moon, it’s just not practical with current technology. The moon is close, and it stays at petty much the same distance from us, so we can get there when we want. The other planets are always changing their distance from us. A trip to Mars would have to be launched at a time when Earth’s orbit and Mars’s orbit are close. The same is true of the return. Moon walkers spent a few hours there. The explorers to Mars would have to remain there until the two orbits were close again–it could be many months. It would take some pretty remarkable human beings to be able to live in that isolated state for that length of time. Life support systems and sustenance for the trip there and back would have to be taken with them or sent separately. The lower gravity there would cause explorers muscles to atrophy, and their health when they returned to Earth would be at risk. Technological exploration is our only option for now. Robots don’t need anything except fuel, which can be supplied by sunlight. They also don’t ever need to return to us. Yep, and that was dramatically true about going to the moon in 1961 — 66 years ago. The very best statement of the obstacles I’ve ever seen or heard was in this clip from the HBO series, “From the Earth to the Moon.” We didn’t have the know-how to do the things we’d have to do before doing the next things we’d have to do to even get to where we could start to address the possibility of getting a man to the moon and bringing him back alive and safe. I just find it mind-boggling that all seven of the original Mercury astronauts are dead (ironically, the oldest died last), most of them having lived full lives, and THIS is how far we’ve gotten with what they started. It’s like the whole population of the United States has been replaced by far more mediocre, less energetic people who are completely lacking in any sense of get-up-and-go. Instead of reaching for the stars, we turned inward to an astounding degree. Rather than building ships to reach to the limits of the solar system (I don’t count drones), we focus all our innovation on little devices we hold in our hands and stare at. And yeah, a lot of that stuff is amazing, but it has its limitations. Just now, I found it tricky to confirm that Glenn was indeed the oldest of the Mercury 7. Why was it hard to Google? Because he was also the oldest man to go into space, so “glenn oldest mercury astronaut” kept giving me references to his Shuttle flight. But in defense of the Web, I was able to check the Seven’s birthdates as quickly as I could type their names into the search field. And of course, I knew all the names off the top of my head. Speaking of modern inconveniences, I’m often surprised at the words that the WordPress spellcheck doesn’t know. As usual, when I run into a blank spot like that, I copied it over to Google to check whether I was misspelling it, and I wasn’t. When I encounter gaps such as that, I push the time in which I will consent to ride in a driverless car farther and farther away…. Once Trump gets sworn into office I wonder if we’ll get a discount on the Russian rockets… since that’s our only ride to the Space Station these days. In so many ways, I truly feel for the generations that were not around when the space race started and the shock of hearing on the radio that Russia had successfully orbited the earth with an astronaut, not a dog or chimp but a living human. Then the rush to get an American in space and to win the race and dominate it for decades. The absolute thrill of watching and listening when Neil Armstrong landed on the moon and said, “Houston, Tranquility Base here, the Eagle had landed”. Then when he stepped onto the surface of the moon and uttered the words, “One small step for man, one giant leap for mankind”. I still get chills when I hear or read those words. My wife and 3 year old daughter were up watching and waiting with so much anticipation, it was simply mind-boggling. Before all of this took place, we lived with each astronaut’s turn orbiting the earth and when the Apollo program was announced, Gus Grissom was the first man scheduled to land on the moon but he died when the capsule exploded along with the two others who were to go with him on the mission. I admit I cried when the news was announced. Later after the first and second successful moon landings, we lived through the harrowing experience of the fate of Apollo 13 when it was in doubt it would make it back home when the now famous words were transmitted back to earth, “Houston, we have a problem”. The generations who were not privileged to live though those exciting times will never know first hand how it felt to see the awesome greatness this country is capable of. Even with the unrest and lack of civility with our politicians and the discord among diversity groups, I still believe in American exceptionalism and our ability to overcome anything when challenged as a nation and that we can come together in a time of crisis. If we ever lose that hope and belief as a people and nation, then we are most certainly doomed to be regulated to the back seat of the bus. It’s unfortunate that Neil Armstrong’s transmission broke up in the middle of his historic statement. He intended to be remembered for “That’s one small step for A man; one giant leap for mankind.” A tiny squelch burst obliterated the one letter word and the quote forever became nonsensical when taken literally as reported. Meant to type “relegated” instead of “regulated” ending with ..bus of relevancy.”. Didn’t sufficiently edit my comment. Do you still have those brown shoes in your closet? Nope; but what I miss are my flight boots. Aviators could wear brown shoes with khakis, but most of us were much more comfortable in flight suits, with our flight boots. Trying to look as “squared away” as the Marine officers, with their dang creases, was a losing battle. We mostly looked the same in our flight suits, except for the length of hair.